Nucor Corporation, together with its subsidiaries, engages in the manufacture and sale of steel and steel products in North America and internationally. The company operates through three segments: Steel Mills, Steel Products, and Raw Materials. 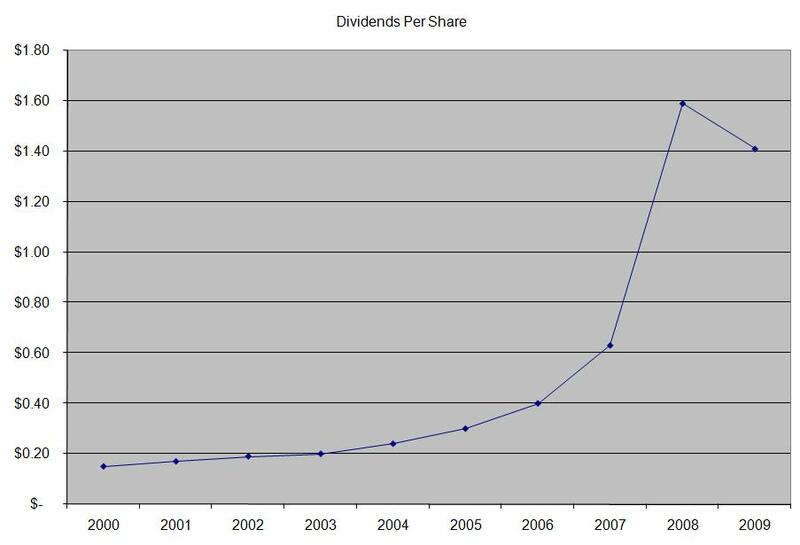 This dividend champion has managed to increase distributions for 37 years in a row. 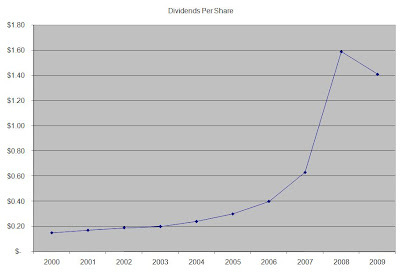 At the company's latest dividend increase in December 2009, the dividend was increased by 2.90%. Over the past decade this dividend stock has delivered a 17.60% annual return on average to its shareholders. This is after a 50% drop off its all-time-highs achieved in 2008. The company reported a loss of $0.94/share for FY 2009, which reflected a 50% drop in revenues and was lower than the $5.98/share reported in FY 2008. For FY 2010 analysts expect Nucor to earn $1.10/share, followed by a steep jump to $3.30/share in FY 2011. The company’s business model is highly cyclical and thus dependent on the economic situation at the moment. Characteristic of cyclical industries is that P/E ratios are lowest when the economy is at its peak, since earnings per share are highest. On the other hand during recessions the P/E ratio is highest since earnings are depressed. Long term growth in earnings will be driven by expansion through acquisitions, which would result in greater pricing power, as well as industry consolidations and stronger cost controls in relation to materials expense. The US steel industry has been in a consolidation mode over the past decade, which could help companies in mantaining pricing power. The company has managed to increase its quarterly dividends at a pace of 28.30% per year. 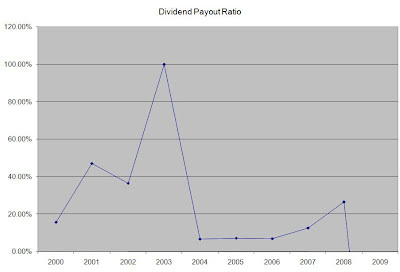 Obviously this strong dividend growth reflected the strong earnings growth, fueled by the increasing demand and prices for commodities up until the global financial crisis of 2007-2009. 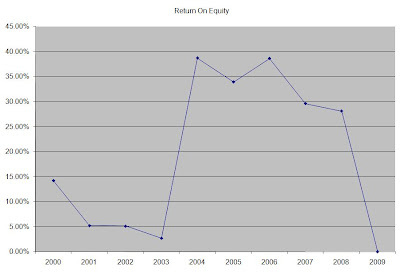 The company paid a special dividend between 2005 and 2008 as well. 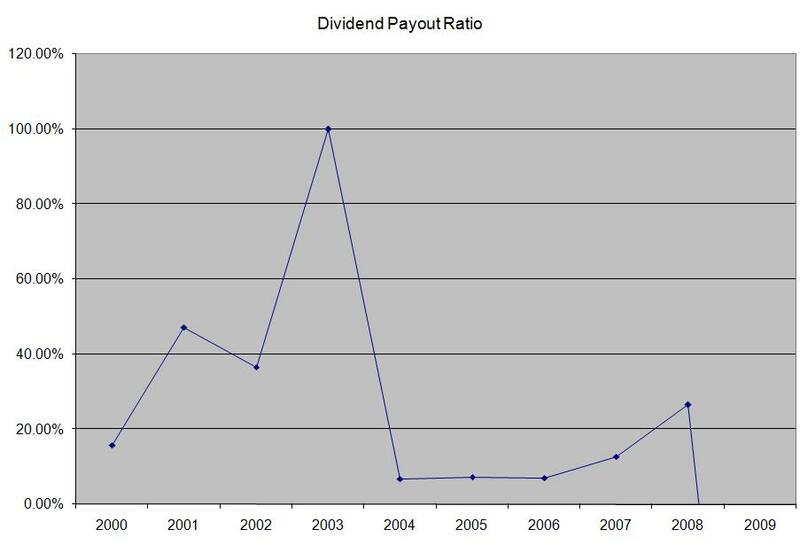 The dividend payout ratio follows the volatility in earnings. Currently the payout looks unsustainable based off FY 2010 actual and expected earnings. 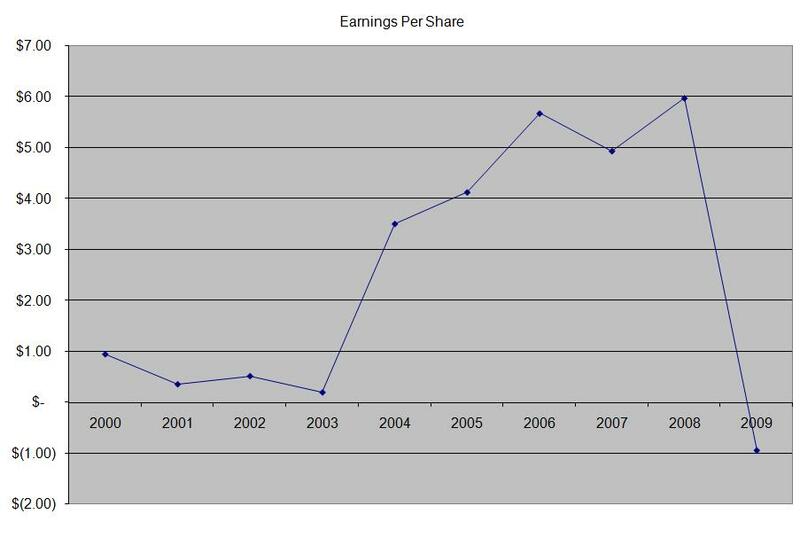 Based off FY 2011 earnings however it does looks sustainable and also leaves some room for a small increase this year. 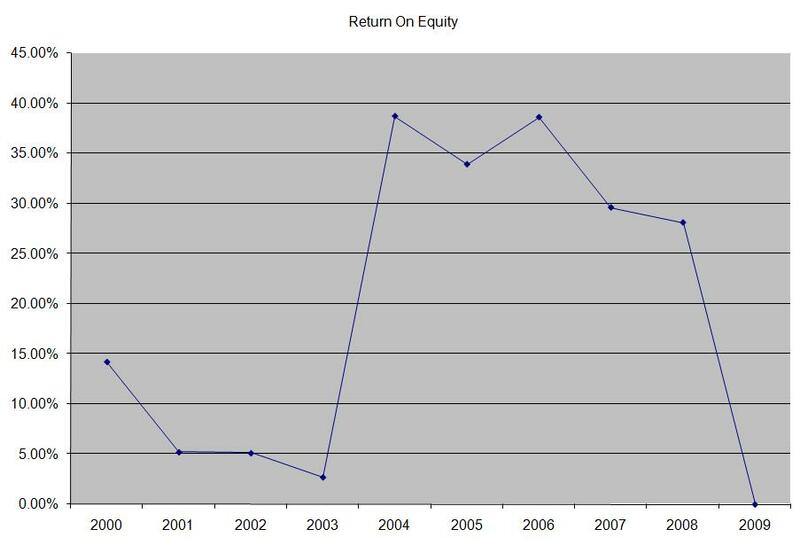 The return on equity also seems to follow the erratic pattern in earnings. It was low between 2000 and 2003, after which it stayed above 28% until 2009. Whether the increased economic activity worldwide leads to an increase in return on equity for Nucor remains to be seen. Currently the company is trading at a forward P/E of 28.70, yields 3.80% and doesn’t seem to have a well covered distribution. However, based on estimates for FY 2011 earnings the company trades at a P/E of 12.10 and has an adequately covered dividend with some room to grow the distribution. The company’s financial position is a little bit more volatile in comparison with other dividend champions, but it should provide decent exposure to basic materials sector for dividend portfolios. I would add to my underweight position in this risky stock on dips.